It costs, on average, more than a hundred dollars per month to own a pet, with dogs costing approximately $139.80 per month and cats costing roughly $92.98 per month. But while taking care of animals can be costly, with expenses from veterinary visits to regularly reoccurring costs, like food and litter, the positive impact pets have on one's mental health is often worth it! Not to mention, they're pretty cute! If you're trying to decide whether or not to get a pet, this ultimate pet guide will help you organize your costs and gain a deeper understanding of the commitment of pet ownership. 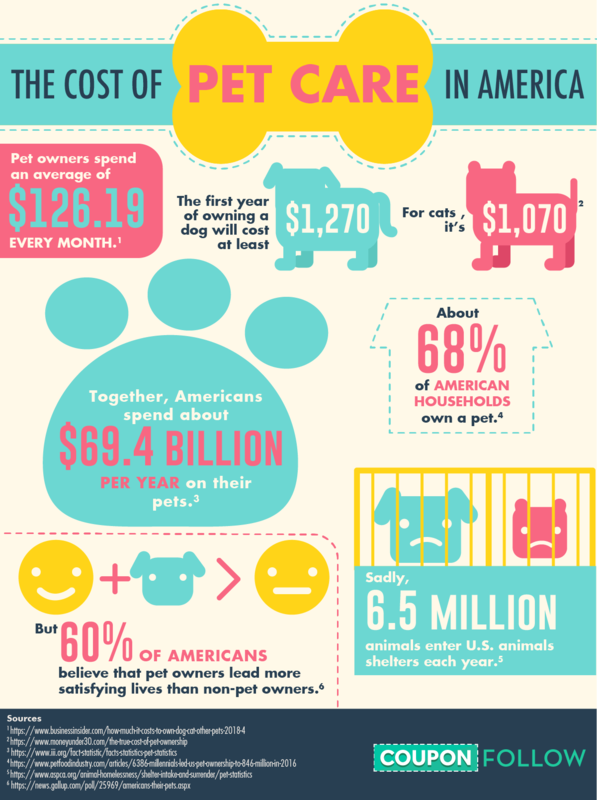 Use this guide to learn all about pet care. Tips for how to take care of pets include everything from buying the right leash to being better prepared during a disaster. There are many things to know before getting a dog, cat, bird, or other type of pet, and this guide will help you plan ahead! If you're considering owning a cat, dog, or other kind of pet, it's important to understand that the animal's welfare will be the owner's - your - responsibility. Pets have a hierarchy of needs just like humans, with biological needs as the baseline, like food, water, and sleep. Social needs, like force-free training, playing, and emotional support are closer to the top. Emotional security is important, but animal care starts with those most obvious needs first. Puppy food is different than adult dog food, and adult food can be different depending on the breed of your dog. Find out how to read a dog food label - dogs need lots of protein. Be sure you're giving the right portions. Be sparing and train with small treats. Try to avoid giving them "people food" or find a way to ensure your dog doesn't beg, though occasional treats given away from the kitchen are fine. Popcorn and carrots are okay; onions, garlic, and chocolate aren't. Cat food can be either wet or dry. Cat food needs to be super high in protein, and portions should be monitored. Instructions on pet birds really depends on your breed, but the ordinary cockatiel usually gets layers of seeds, pellets, vitamins, and mineral supplements. You should also provide your cockatiel dark greens every other day, an apple or banana once a week, and a honey stick about once a month. Other pets, like snakes, will have very specific needs. Be sure to read any manuals and guides, and never make assumptions about which food they can and cannot eat. Pets that are not vegetarian should not be made to be vegetarian. Try to provide food that's as close to what they could get in the wild as possible. Doing otherwise can harm your pet. All pets need a certain amount of fresh (and sometimes even running) water. Prevent mold and bacteria by cleaning out water containers frequently! Dogs should be walked at least 30 minutes every day. Remember that small dogs may need a slower pace. While it's not necessarily common practice, walking your cat with a leash and harness can help them stay fit. Ferrets are also fond of walks! Pet birds should be given safe, out-of-cage time. Also, you can play games with your bird with toys, or even encourage them to dance. Remember that birds are very social, and need attention as much as exercise. Just like with humans, pet shouldn't be exposed to the elements. With some pets, consistent temperature is considerably more important than for humans. Dogs should be given winter gear; fur is often not enough, even for huskies. An unheated dog house is not enough. Cats should be brought in during winter weather as well. To prevent many different kinds of diseases, parrots and most pet birds need exposure to UV light on a fairly regular basis. They can become vitamin D deficient just like, though faster, than humans. Snakes, especially ball pythons, not only need consistent heat, but consistent humidity. Keeping a cage that encourages both is one of the top expenses for owning these types of pets. Vaccinating, providing heart-worm medication, preventing and watching for ticks and fleas, examining your pet's skin for rashes, and visiting the vet annually not only makes your pet happier, but also prevent some costly episodes of easily preventable illnesses. Ask your vet for a full list of medications you'll need to give you pet on a one-time and annual basis. No, not all pets need to be pampered like a poodle, but most will need to be groomed to prevent discomfort and potential disease. Most dogs can be bathed every few months, though it depends on the breed and how often they're playing outside. Cats need to be bathed after certain flea medications, if they've gotten into a sticky or dirty substance (like soot), or if they're too old to groom themselves properly. Otherwise, they generally bathe themselves. Older cats and dogs will sometimes get matted fur that's difficult to get out. Try to do so as painlessly as possible. Both cats and dogs need their nails clipped without damaging the finger-like blood vessels inside the nail, called the "quick". Remember that over-plucking feathers is a sign of a lot of bad things for your bird! If they start, there may be something up with their cage or their situation. Birds often like to bathe in a bowl of shallow water once a week or month, but don't bully them into bathing - try a different shaped bowl or different temperature of water. Rabbits, mice, and most rodents only need to be bathed if they've soiled themselves in an extreme way, are too old to groom themselves, or are ill in some way. So those are some of the bare necessities, but covering just dog food and water the isn't necessarily how to be a good dog owner. There's lots of things you can do that tackle issues higher up on the hierarchy of needs. Training makes your life easier. Rules and a safe environment can also give your pet peace of mind. Consistency and calmness is key! Positive reinforcement from the psychological principals of operant conditioning is simply more effective than most forms of punishment or negative reinforcement. In simpler terms, it's more effective to reward your pet (for instance with smiles, petting, or treats) than punish for bad behaviors (yelling or spraying with water). But timing and consistent rules are important, as well as the number of steps needed to ensure that your pet associates the good behavior with a positive reward. If you're looking for tips for raising a puppy, potty training will often take center stage before teaching other commands. Again, the most effective methods center around praise for accomplishments rather than older methods, like "rubbing its nose in it". Give cats plenty of toys to scratch at key places around the house; don't give them ones that resemble your furniture, as that may be confusing for them. If they do scratch your furniture, try wrapping in a sheet or aluminum foil or spraying it with a natural citrus spray. Service and emotional support pets must be housebroken, under the control of the handler (preferably with a leash and voice control), and vaccinated in order to legally qualify for their role. Many seeing-eye dogs and other expert dogs are trained by professional, enthusiastic trainers. Service animals have a much more rigorous training than therapy animals. If your pet is mild-mannered and calm, they may make good therapy pets; volunteering locally can be a big help to your community! Dogs, cats, birds, bunnies, and most animals need some form of socialization other than with you. Dogs, especially, should learn how to be social with other humans, children, and other dogs, optimally between three and 12 weeks of age. Cats should be socialized between two to 14 weeks with cats and people. If you're trying to socialize pets with each other, let the smaller animal set the pace and stay calm. To cover all these basic needs, we've helped by compiling some lists of important items you should buy for your pet, from pet beds to the right kibble! Food: See our notes about food. Collar or Harness: Consider a harness if your dog is small, barrel chested, or too strong for you to pull on. Tags: Tags should have a name, address, phone number, and any important safety or health information, such as if your dog is blind or has a medication allergy. Crate: The crate should be big enough for your dog to fully stand up and turn around. Note that you might need to buy another crate after your puppy grows up. Stain and Odor Removal Cleaners: Be sure to grab non-toxic options that are safe for pets. Toys: For dogs, especially puppies, be sure to have both throw and pull toys. Grooming Equipment: For dogs, you'll need dog shampoo, brushes, toenail clippers, and ear cleaners. Cleaning Supplies: You'll need miscellaneous supplies like wipes and paper towels. Collar with a Tag: If you let your cat go outside, make sure it has a collar and tag with its name, your phone number, your address, and any important medical information for the cat. Microchips may also be a consideration. Leash and Harness: If you plan to take your cat on walks outside, you should not pull your cat by a collar, but get a harness that goes around their shoulders. Kitty Litter and Box: There are many different choices of type of litter, from newspaper to clumping clay. Grooming Equipment: Cats might bathe themselves, but they still need a bristle brush, fine comb, toenail clippers, and a toothbrush. Cage: A too-small cage might lead to feather plucking and other unhappy behaviors, so be sure to use the right size and the right bar spacing for your bird. Perches and a Hideaway: Give your birds room for activities! Travel Cage: You'll need this in emergencies and to go back and forth to a vet. UV Light Source: If natural light isn't available in your town year round, you may need to invest in a light source with UV spectrum light. Checklist for Pet Snakes: Note that different types of snakes have different needs. For instance, ball pythons will need a consistent climate to be happy. Don't worry: It's easy to find coupons on cool pet stuff. Coupon rewards and discounts exist for most major sites like Chewy.com, PetSmart, and 1-800-PetMeds. Buying certain items in bulk can also be a good idea; just remember to store items like food well, as pet food does have an expiration date. Another important responsibility of a pet owner is to remove household items that might hurt a pet. Don't leave extra wrappers or packaging on the floor, and make sure there's nothing they might accidentally ingest, fly into, hide in, or hurt themselves on. Cats are known to jump into washing machines and closets, and dogs are known to indiscriminately eat things that have fallen on the floor. Making sure that any garbage cans around the house have a lid that secures is very important. Chicken bones, small toys, floss, string, holiday decorations, and other small items may be eaten and then choked on. All pets are susceptible, but birds are particularly vulnerable to toxic fumes and smoke. If your dog or cat is not breathing or doesn't have a heartbeat, you can do CPR and chest compression similar for humans, though your hand placement will be different: For cats and small dogs, you'll want to lay them on their sides and place the heel of your hand over the pet's heart. For barrel-chested dogs like pit bulls, you'll want to lay them on their back and place your hand on the widest part of the sternum and lock your elbows. Watch a few videos to ensure you won't be panicked if the time comes to use it. Get tags that have your current contact information on them. If you live in a cold weather climate, make sure you have extra blankets and jackets for your pet. Find shelters that will take pets long ahead of time. Get a free sticker from the ASPCA. Make sure you've purchased a travel carrier for your bird, often with a blanket wrap to calm them. There are many responsibilities and costs that pet owners take on when they decide to adopt or buy a pet, but having such a wonderful animal in your life can be worth it! Take the time to make a game plan with our ultimate pet guide and save!